we had a little dinner party the other night that consisted of lemon pepper grilled chicken, corn & rice with cilantro and avocado, cheddar-green onion muffins and then we finished the meal with these: chocolate cream cheese cupcakes. i mean, after such a healthy meal, you need some cupcakes like these. it’s genius really – someone figured out a way to breed the chocolate cupcake with cheesecake. the devil’s food cake outer part of the cupcake is rich and moist, and then you have the creamy cheesecake center, flecked with chocolate chips that melt in your mouth. 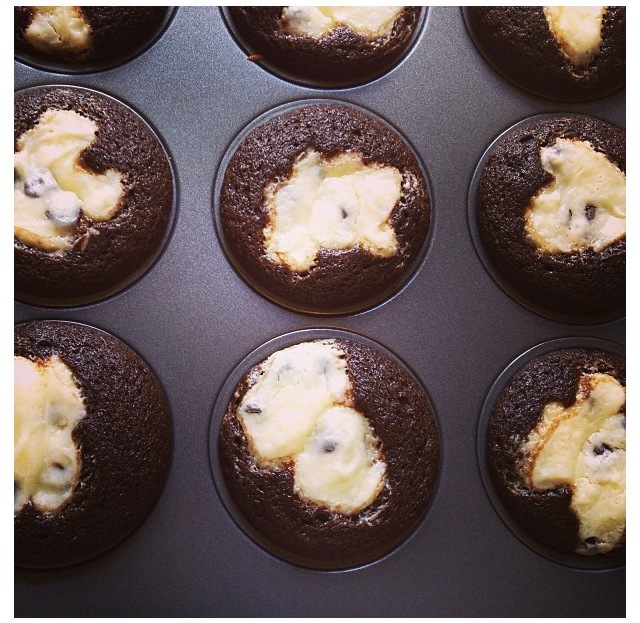 2. line muffin pans with foil or paper baking cups. using an electric mixer, combine the cream cheese, 1 cup sugar and 1/8 tsp salt. add the egg and mix well. fold in the chocolate chips and set aside. 3. in a large mixing bowl, whisk together the flour, the remaining 1 1/2 cups of sugar, 3/4 tsp salt, the baking soda and cocoa powder. add 1 1/2 cups of water, the oil, vinegar and vanilla and stir until smooth. 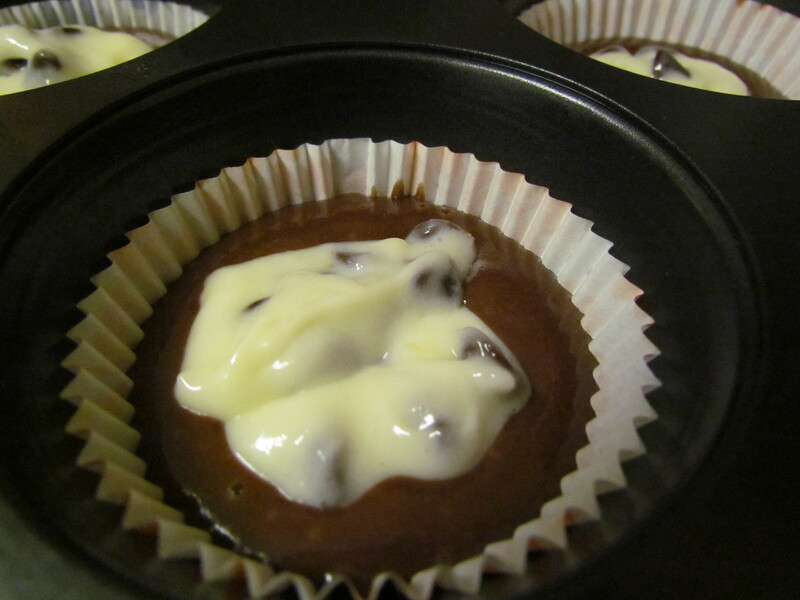 4. fill each baking cup 2/3 full with the cake batter and top with 1-2 tbsp of the cream cheese mixture. 5. bake until the edges are firm to the touch, about 25 minutes. 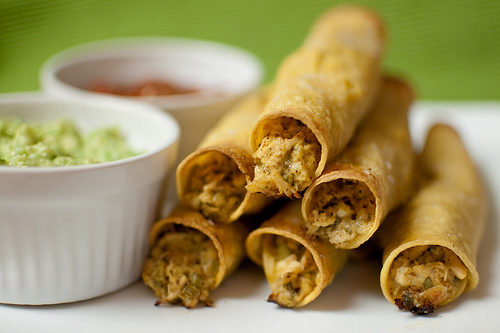 i make this appetizer for almost every potluck. i made it for the little she’s first birthday party. it is requested often throughout the year. and i swear i would make it for only myself for no other reason than to sit and eat it all in one sitting. and i can only tout it that way because it is not my own recipe. the credit belongs to my oldest and dearest friend, lacey. we have been friends since we were 2 years old and lived across the street from each other. she is a fantastic cook and i am always peeking in her kitchen for my next favorite recipe. 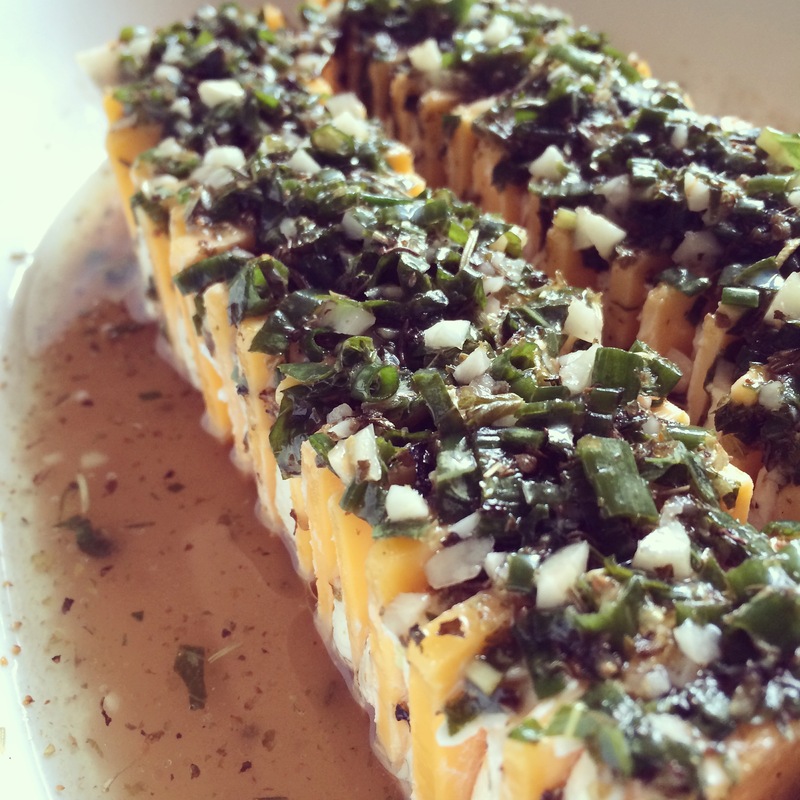 1. in a bowl, combine the vinegar, EVOO, seasoning, sugar, basil, green onions & garlic. 2. slice up both cheeses and alternate them (cream cheese, cheddar cheese, cream cheese & so on) in two rows on a serving dish with sides at least 2 inches high. 3. pour vinegar & seasonings mixture over the cheeses and refrigerate for at least 3 and up to 8 hours. every 30 minutes, take cheese out of the fridge and re-dredge the cheeses with the vinegar mixture in the bottom of the dish. 4. top with chopped tomatoes & serve with table water crackers.